China’s high-speed railways now exceed 20,000 km in length with the opening of a line linking Zhengzhou in central China’s Henan Province with Xuzhou in eastern Jiangsu Province Saturday. People in Langfang in Hebei, 55 km (34 miles) south of Beijing can commute to Beijing in only 21 minutes using the high speed rail. It is doable to commute 100 miles along high speed rail into major cities. The 360-km line has nine stations and trains run at a speed of up to 300 km per hour in the initial period. The line connects the west with two major north-south lines, helping cut travel time between west and east. When another line linking Baoji and Lanzhou is put into operation, high-speed trains will run all the way from Xuzhou to Urumqi in the country’s far west. Huang Xin of China Railway Corp. said the first 10,000 km took 11 years and has since doubled in only three years, and is expected to nearly double again by 2025 and reach 45,000 km in 2030. In 2015, China’s high-speed trains carried 961 million passengers, up 237 percent from the number in 2011. Chinese bullet trains have also found international customers in Indonesia, Russia, Iran and India. Construction of a 150-km high-speed link between the Indonesian capital Jakarta and Bandung began in January 2016. It will cut travel time between the two cities by about two thirds. As of October 2013, high-speed rail was carrying twice as many passengers each month as the country’s airlines. Guangzhou–Shenzhen–Hong Kong Express Rail Link (XRL), is a high-speed railway line to be inaugurated in phases between 2011 and 2018. 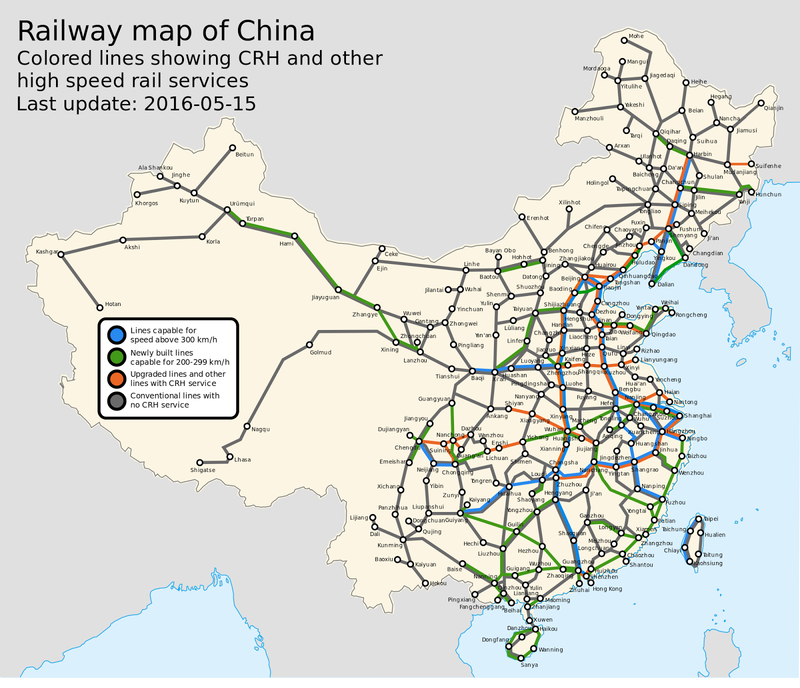 It will connect Beijing, the capital city of China, and Hong Kong (Kowloon) via Canton/Guangzhou and Shenzhen.